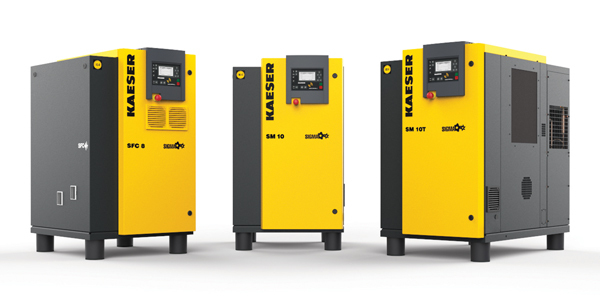 Kaeser Compressors introduces the new SM 7.5, SM 10, SM 15 and SFC 8 models as the latest examples of their ongoing commitment to product developments designed to reduce customers’ energy costs, improve overall performance and extend service life. The new SIGMA 06 airend with increased intake capacity, combined with IE4 motors on the 10- and 15-hp models, delivers up to 10 percent more flow than prior versions and as much as 43 percent more flow than comparable competitive models. Specific power (compressor efficiency) has improved up to 10 percent over prior models and is up to 23 percent better than comparable competitive units. The new update also includes a dual-flow fan combined with an external facing cooler, resulting in approach temperatures as low as 7 °F. This improves the effectiveness of downstream dryers and filters in removing contaminants that impact product quality and tool life. The die-cast, sickle-shaped blade of the dual-flow fan reduces noise and cools both the drive motor and interior of the machine for greater reliability. Sigma Control 2 comes as standard for all models, combining reliable energy efficient control with access to operating and maintenance information. A built-in web server and communications ports allow easy remote monitoring. The SFC 8 models feature a separate drive cabinet with dedicated cooling to protect the frequency converter and maintain optimum operating temperature. Both the SFC control cabinet and Sigma Control 2 are both tested and certified as individual components and as a complete system to EMC directive EN55011 for Class A1 industrial power products. The SM Series is available in 7.5 to 15 hp with flows from 19 to 55 cfm and pressures up to 217 psig. To reduce floor space and installation time, these models are also available with integrated dryers and as AIRCENTERS with an integrated dryer, filter and storage tank. For more information, visit us.kaeser.com/sigma. To be connected with your local authorized Kaeser representative, call (877) 417-3527.